Tagunda is a teeny, tiny business. At it’s core, it is a husband and wife team with occasional help from friends. When you are that small, every little bit of validation counts. The more legit Tagunda feels, the more motivated and inspired we get. With that in mind, we applied to have our Facebook page verified, which it was. There is now a fancy, little check mark next to our name, and it feels awesome. 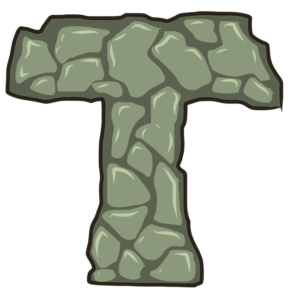 Making money in indie games is hard, and Tagunda is not even close to profitable. First and foremost, we are doing this because we love games, and we would be making them regardless of whether anyone cared. That said, there are days where it does feel like we are just sitting in the home office, pouring hours into projects that may end up forgotten or drowned in a sea of other titles. Or days where we struggle with impostor syndrome. That’s where little check marks on silly Facebook pages come in handy, as a reminder that we’ve committed to the cause, and – at least in the eyes of Facebook – we are a real studio! 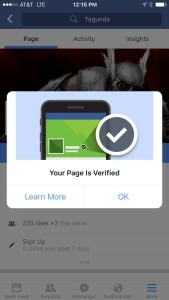 If you’re an indie developer, I strongly urge you to get verified, not just on Facebook, but wherever you can. Hang your business license in plain sight, as a reminder that you’re serious, and revel in feeling all official and stuff. And if you haven’t yet, you should totally go like our VERIFIED page. Things are happening behind the scenes at tagunda. Torgar’s Quest is progressing nicely and scheduled for a March release. Beta testing is coming to an end, and we are moving into the pre-launch phase. Expect a lot more on that in the weeks to come, as we work towards listing the game on Steam Greenlight. Secondly, we will start posting more content on a regular basis. This content will focus on the game making process. I will be sharing glimpses from behind the scenes, thoughts on process and design, tips and recommendations, and whatever else is deemed relevant and interesting. Finally, the company is going from a one-man show, to being a mom-and-pop business. An accomplished gamer with years of community management experience and social media super powers, Kelly Cline (who also happens to also be my better half), will be taking an active role in tagunda. Kelly will be the primary voice of tagunda on Twitter, in newsletters and elsewhere. She is also involved in deciding things like which projects get prioritized in the future, and she has a ton of ideas there. I’m happy to announce that my partner in life, is also my partner in business. Stay connected with us, and sign up for our monthly email newsletter. It’s an easy way to stay informed and never miss out on anything tagunda! We hope to see a lot more of you in 2016! Woohoo! We’re celebrating labor day by taking down the single placeholder page that has been the Tagunda website so far, and replacing it with this – an actual site with real content. In the future, you will be able to find updates and news regarding Tagunda and our games right here. For starters, you can read more about our games and even download/play Greeny’s Run. Thank you for stopping by and reading the very first update on our brand new site.